With machinist and engineer Mr. Theodore A. Goffe at the controls, the Oregon Pony made its debut run on the morning of May 10, 1862 (Morning Oregonian 23-July-1905). The tracks of the Oregon Portage Railroad, the state’s first, ran between Tanner Creek (not the Northwest Portland Tanner Creek, but a creek of the same name near where the Bonneville Dam is now) and Cascade Locks. The locomotive was built by Vulcan Iron Works of San Francisco for the Oregon Steam Navigation Company, which operated the railroad and steamships that served the Columbia River ports of Astoria, Portland, and The Dalles. The Oregon Pony was used to portage steamboat passengers and goods past the Cascade Rapids (which were inundated when the Bonneville Dam was completed). In 1864 another railroad, with heavier locomotives and better rails, was built on the Washington side of the river. The Oregon Pony’s duties briefly shifted to a portage railroad around Celilo Falls, but in 1866 the locomotive was sold and shipped to San Francisco, where it was used to grade roads. 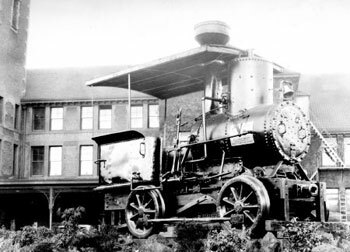 In 1904 the locomotive was donated to the Oregon Historical Society, which displayed it at the 1905 Lewis and Clark Exposition and then later at the Albina Rail Yard. It was put on display at Union Station in the 1930s, and then returned to Cascade Locks in 1970. Restored by the Port of Cascade Locks in 1981, the Oregon Pony is now on permanent display in a weatherproofed enclosure at Cascade Locks Marine Park near the Cascade Locks Historical Museum.